Jane Austen wasn’t actually talking about my mom, but she could have been. Mom grew up in a tiny Mississippi town, attended a three-room schoolhouse until high school, and never traveled extensively. But Mom was, and still is, a reader. She read everything from novels to science magazines. Google didn’t exist when I was ten, but my mother did, and that was pretty much all I needed. My four older siblings attended public school all the way up, but when I was fourteen, my parents decided to homeschool my sister and me. Mom brought all her knowledge and love of literature to my high school education. She taught us how to crochet, then read us A Tale of Two Cities while we made afghans for my brother’s first baby. She insisted I’d like Jane Austen, but I came to her with Pride and Prejudice and complained that it wasn’t funny like she said it was. She took it and read the first two chapters aloud to me. Through her voice, I understood the subtle wit in almost every line, and have been in love with Austen ever since. She had me read poetry (which I still don’t like) but said I didn’t have to read Faulkner (which I still haven’t). She didn’t put many limits on my reading. That means I read some utter trash—but I also read some beautiful works. And I learned to tell the difference. He came to visit my family. 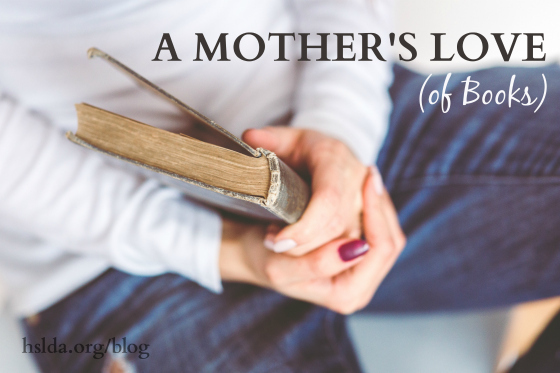 I sat on the couch and listened to my boyfriend and my mother discuss books and authors I’d never heard of, and I realized I didn’t have much to worry about. Now that I have my own family, I can see the same love of language and literature blooming in my children. We do have to be intentional about filling in the science-math-athletic gaps, which isn’t as instinctive to our family. But as I watch my children devour books and write their own stories, I’m grateful for a mother who loves words, cultivated that love in me, and has helped pass it on to a new generation.